RV refrigerators, for the most part, are efficient. In many cases it is something the owner does that makes the refrigerator less efficient. For starters keep in mind that your RV refrigerator is different from the one in your house. Your RV refrigerator doesn’t use a compressor or any moving parts for that matter. It works off of the principle of absorption. Instead of applying cold directly the heat is drawn out, or absorbed. The theory is, when there is an absence of heat there is cold. 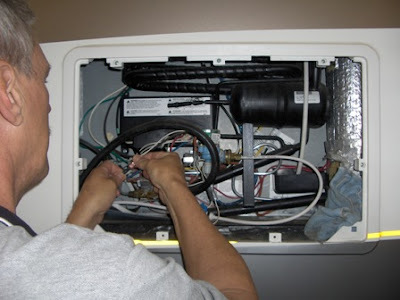 Basically your RV refrigerator uses heat, either from an electric heating element or LP gas flame. The heat starts a chemical reaction and then through evaporation and condensation causes it to cool. 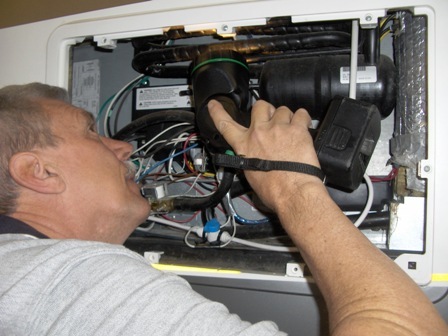 There are several things we can do to help the refrigerator do its job more efficiently. First and foremost the RV must be fairly level for the refrigerator to operate properly. Older RV refrigerators required more precise leveling, but even the newer models need to be close to level for optimum performance. 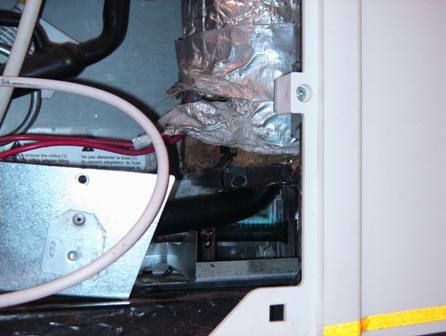 Over time a cooling unit operated out of level will be permanently damaged. As far as the operation of the refrigerator goes, traveling with the refrigerator on will not cause problems because the liquids and gases in the cooling unit are constantly moving around. They don’t collect and stay in areas of the cooling unit like they can in a stationary, out of level refrigerator. The initial cool down process can take four to six hours. You should turn the refrigerator on the day before you plan to leave, and before you put any food in it. When you do load the refrigerator the food you put in should already be cold, and the food put in the freezer should already be frozen. Putting cold food in the refrigerator, rather than adding warm food, lets the refrigerator work less to cool down. One common mistake made is to over pack the refrigerator. There has to be space between the foods to allow for air to circulate throughout the compartment. In most situations you will have access to a store where you can buy food. A two to three day supply should be enough. To assist with air circulation you can purchase an inexpensive, battery operated refrigerator fan. Put the batteries in and place the fan in the front of the refrigerator compartment blowing up. The fan will improve the efficiency by circulating the air and it will reduce the initial cool down time by 50%. Another good idea is to install a 12 volt, thermostatically controlled refrigerator vent fan at the back of the refrigerator, or at the top of the roof vent, to assist with drafting the hot air away from the refrigerator. If you are mechanically inclined these fans are fairly easy to install, or you can have your RV dealer install one for you. Either way it’s worth it. The fan removes the heat built up behind the refrigerator improving the refrigerators performance by up to 40%. 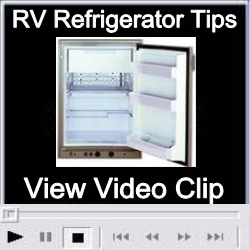 The outside temperature also affects the operation and efficiency of your RV refrigerator. When it’s cold out you can lower the temperature setting and when it’s hot out you can raise the setting. Some refrigerators are preset by the manufacturer. Extremely hot weather will directly affect the refrigerators efficiency. When it’s really hot outside try parking your RV with the side the refrigerator is on in the shade. Periodically inspect and clean the refrigerator door gaskets. Check them for a good seal. Place a dollar bill behind the seal and close the door. It should stay there and not drop. When you try to pull it out there should be some resistance felt. Do this in several different places and have any damaged seals replaced. Try to limit the amount of times you open the refrigerator or freezer doors and the length of time you leave the doors open. Last but not least you should always have a small thermometer in the food compartment. Food can begin to spoil at temperatures above 40 degrees. RV absorption refrigerators do a great job for RVers. They will do an even better job, and last longer, if we apply these simple tips to make their job easier and less demanding.